Jamie Caroline converted pole position into a dominant victory in race one at the Brands Hatch Grand Prix circuit, as Carlin's supersub delivered the goods once more in BRDC British F3. Caroline had a great first lap and built a big gap of over three seconds in the first half of the race, and headed home championship leader Linus Lundqvist. The Swede gained two positions off the line to claim second and therefore extended his championship lead over Nicolai Kjaergaard who claimed third. On his local circuit, Billy Monger secured fourth place ahead of Carlin team mate Sun Yue Yang in fifth. 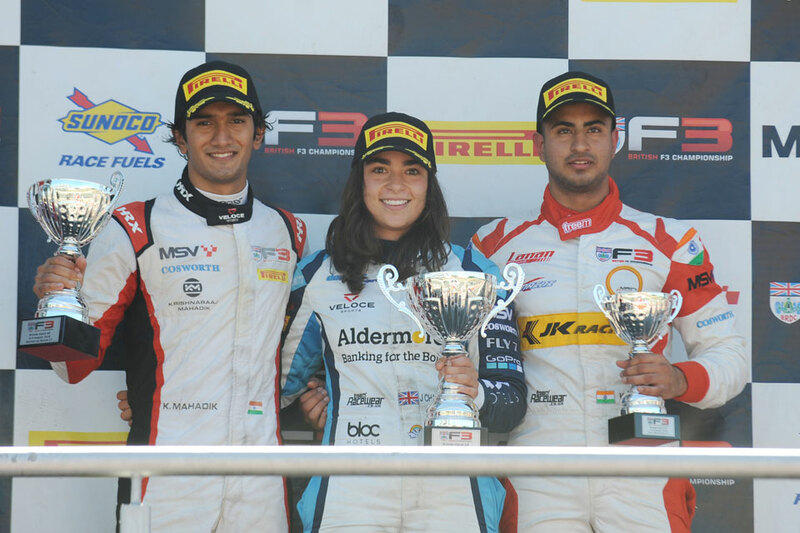 Kush Maini claimed sixth for Lanan Racing ahead of Double R Racing's Krishnaraaj Mahadik, with Manuel Maldonado eighth for Fortec Motorsports. Tom Gamble and Sasakorn Chaimongkol completed the top-10. Douglas Motorsport's Jamie Chadwick is the first woman to win a British F3 race, after taking victory at Brands Hatch in the second contest of the weekend this morning (Sunday). Chadwick, the 2015 British GT4 Champion, finished second on the road behind Double R Racing's Pavan Ravishankar, with the Singaporean climbing from third to first at the start, but was adjudged to have made a false start and was handed a 10 second time penalty. Krishnaraaj Mahadik soared from ninth on the grid to claim second, with Kush Maini following suit to claim a podium from 10th on the grid. Sasakorn Chaimongkol was fourth for Hillspeed, ahead of Douglas Motorsport's Arvin Esmaeili, who looked on course to claim a podium early on before being passed after a safety car period, and eventually finished just 0.062s ahead of Hillspeed's Jusuf Owega. Fortec duo Manuel Maldonado and Tom Gamble claimed seventh and eighth, with Carlin's Nicolai Kjaergaard ninth having started 13th. Ravishankar was eventually classified 10th after picking up his penalty. At the start, Ravishankar made a speedy get away from third on the grid to take the lead before Paddock Hill Bend, with Chadwick also making a decent start to climb to second. Almost immediately, a penalty was handed to Ravishankar, with the Singaporean still leading on the road, with himself and Chadwick almost two seconds ahead of the rest of the field at the end of lap one, with Esmaeili holding third early on from pole sitter Ben Hurst. The Safety Car was dispatched at the end of the second lap, with Hurst off in the gravel at Clearways, and eliminating the comfortable gap the lead duo had at the front. Race one winner Jamie Caroline, who had climbed from 15th on the grid to 11th at the end of lap one, also suffered a difficult lap and dropped to the tail of the field. The safety car pitted at the start of lap seven, with Ravishankar leading them across the line with Chadwick following closely. The lead two began to eke out an advantage again, while Esmaeili tried to fend off a pack of several cars behind him as he aimed for his first podium. The podium pursuit didn't last too long as he was shuffled back on lap nine, with Mahadik's impressive rise through the order continuing by blasting by into what was effectively second place, with Maini and Chaimongkol also moving past. At the front, Chadwick was operating around half a second behind Ravishankar, with the win looking comfortable, but Mahadik was charging, and eventually finishing just 0.439s behind at the chequered flag, with Maini only a further 0.288s behind. Mahadik's race was particularly impressive, gaining two places on lap one, another place on lap two, and then continued his charge after the safety car, taking fourth on lap seven before finally passing Esmaeili. Maini's race was similarly busy. He held his 10th place on lap one, but frantic action on lap two saw him surge to fifth before the safety car. He dropped to sixth after being passed by Mahadik on the first lap after the safety car, but was up to fourth by lap nine, and claimed his podium after Ravishankar's penalty was applied. DNF. Ben Hurst, Hillspeed, +12 laps. Carlin's Nicolai Kjaergaard returned to the top step of the podium with a controlled victory in the final race of the weekend at the Brands Hatch Grand Prix circuit. Taking his first victory since the Snetterton round, Kjaergaard finished ahead of team mate Jamie Caroline who shadowed him throughout, while championship leader Linus Lundqvist claimed third, his second podium of the weekend. Tom Gamble secured his best result of the event with fourth, holding off a prolonged challenge from Carlin's Billy Monger who took fifth. Kush Maini claimed seventh ahead of Manuel Maldonado, who held off a queue of cars including Krishnaraaj Mahadik, Jusuf Owega and Sasakorn Chaimongkol.